Nitrogen deficient plants are stunted and their leaves pale green. Older leaves have bright orange, red and purple tints and defoliate early. Symptoms first appear in older leaves because N is mobile and is translocated from older to younger leaves when N supply is insufficient. Younger leaves may appear grey, stiff and waxy. Heads of N deficient plants form late [N32, N42]. The N deficient plant is stunted and older leaves are pale green (photo taken by Patricia Lazicki). Increasing N rates reduce the incidence of misshapen heads and improve floret color. However, the risk of hollow stem and head rot increases with high N rates [N2, N3, N9, N39]. Samples are taken from the top foot of the soil profile, which is the major rooting zone [N17]. Even though broccoli roots may be found below a depth of three feet, most roots grow in the top foot of the soil profile [N28, N38]. However, a recent study suggested that broccoli is able to access substantial amounts of N from below the top foot of the soil profile[N28, N36]. Zones of recently banded fertilizer applications should be avoided so that the N availability is not over-estimated [N16]. For more information on sampling procedure see Sampling for Soil Nitrate Determination. Soil samples can be sent to a laboratory or extracted and analyzed on the farm. The soil nitrate quick test with colorimetric test strips is highly correlated with the standard laboratory technique and has been found to be a reliable estimate of current soil N status, with sufficient accuracy for routine on-farm use. Although the quick test is less accurate than a standard laboratory analysis, its accuracy is generally sufficient for routine on-farm use when done correctly. With the quick test soil nitrate can be determined in a timely manner in order to make N fertilization decisions [N19, N20]. For the soil nitrate quick test, 30 mL of a of a calcium chloride (0.01 M) or a aluminum sulfate (0.025 M) solution are measured into a clean 2-oz bottle or centrifuge tube with a mark at 40 mL. Field moist soil is added until the extractant reaches the mark. The tube is then capped and vigorously shaken for about 1 minute to disperse all soil aggregates. The soil particles are allowed to settle until clear supernatant forms. The nitrate concentration in the supernatant can be measured with nitrate-sensitive colorimetric test papers [N19, N20]. More detailed instructions can be found here. Several studies carried out in commercial broccoli fields and other cool-season vegetables on the Central Coast found that no fertilizer N is necessary as long as the soil nitrate-N level is above 20 mg/kg (= 20 ppm) [N15, N18]. A concentration of 20 ppm nitrate-N in the top foot of soil equals approximately 80 lb N/acre. In the absence of leaching, this amount of N could supply a crop for at least ten days to two weeks, even at peak N demand [N17]. If the nitrate-N concentration in the soil is below 20 ppm, only enough N to increase the soil nitrate-N level to 20 ppm is needed (see In-Season N). Contact your local farm advisor for more information. Recently matured leaves, typically 3-4 nodes down from the growing point, are used for tissue analyses. A minimum of 20 leaves should be collected, each from a different healthy plant of representative vigor [N17]. Samples are taken from the entire field. Variable fields should be divided into uniform blocks, which are sampled separately [N17]. It is important to accurately determine the crop growth stage since the total N concentration declines as crops develop. Once tissue samples are collected, they should be dried as quickly as possible [N17]. For more information on sampling procedure see Plant Tissue Sampling. For petiole sap nitrate-N analysis, the entire petiole or midrib is used when plants are young. In more mature plants with large petioles and midribs, the center section can be used [N17]. Plant tissue can be analyzed for total nitrogen or nitrate-N concentration. 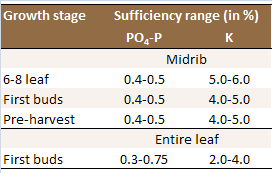 The total N concentration (Table 1) of whole leaves indicates the longer-term N availability, while the petiole nitrate-N concentration (Table 2) reflects more the current conditions [N17]. Total N concentration is considered a better measure to monitor crop N status; however, this technique has not been widely used in the California vegetable industry [N17]. For more information, contact your local farm advisor. Table 1: Optimum whole-leaf nutrient concentrations in the most recently matured leaves. Sources: 1) [N5]; 2) [N22]. Petiole nitrate-N levels have been found to be insensitive indicators of the current soil N availability, especially when excess N is available [N14, N16, N17, N20, N31]. 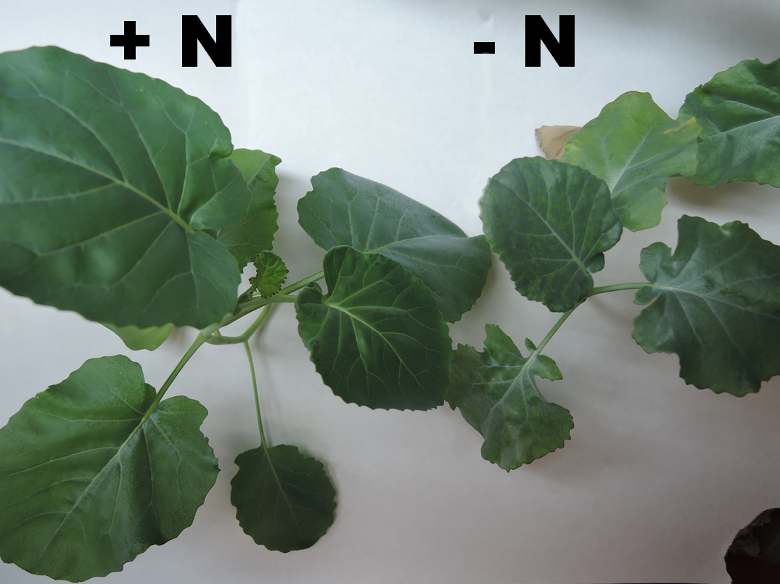 Fertilizer N decisions should therefore not be based solely on petiole nitrate-N tests [N31]. Readings of nitrate concentrations in the petiole fresh sap made with the handheld Cardy meter are correlated with the dry petiole nitrate concentration but are not very sensitive indicators of the crops N status either [N23, N24]. However, petiole nitrate-N may be used as a diagnostic test to confirm N deficiency. Table 2: Approximate sufficiency nitrate-N range for in broccoli petioles. Sources: 1) [N7, N13, N17]; 2) [N23, N17]. Pre-plant N applied in fall is not recommended as the nitrate is highly susceptible to leaching below the root zone by winter rain [N24, N35]. 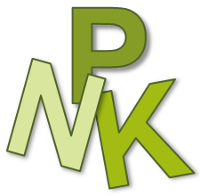 N uptake is low during the first 3-4 weeks after planting or until the 4-6-leaf stage, accounting for less than 10% of the total N accumulated in the aboveground biomass of well fertilized broccoli crop [N4, N41]. Therefore, large pre-plant or starter applications are not needed. However, it is critical that young plants do not suffer N stress in order to achieve a high yield [N12, N21, N24]. For broccoli, 20 to 30 lbs/acre nitrogen are applied either pre-plant or as starter [N25]. Even in fields with low residual soil nitrate concentrations, the pre-plant or starter N application should not exceed 60 lbs/acre in order to reduce the risk of leaching losses [N24]. To ensure that N is available in the root zone of young plants, the irrigation management needs to be optimized to prevent nitrate movement below the root zone. Broccoli requires little N in the early phase of growth. However, it is critical that young plants do not suffer N stress in order to achieve a high yield (see pre-plant N). Small quantities of N (20-30 lbs/acre) are generally applied either pre-plant or at planting [N25]. Fertilizer should be banded at the time of seeding or transplanting cole crops. Bands should be located 2-3 inches to the side of the seeds or plants and 3-4 inches deep [N29]. Splitting N applications has not always been found to be superior to applying all N at planting [N10, N21, N24]. However, high pre-plant or starter application rates considerably increase the risk of nitrate leaching below the root zone. For this reason, split applications of N are highly recommended. When leaching losses are minimized, the seasonal N application rates for broccoli should not exceed 180-240 lbs/acre for winter and spring production and 150-180 lbs/acre for summer and fall production [N17]. However, the required N rate depends on soil nitrate content. Crops produced from late fall through early spring generally require more fertilizer N because the residual soil N content tends to be lower during this period compared to the summer months [N17]. Several studies carried out in commercial fields of broccoli and other cool-season vegetables on the Central Coast found that when the pre-sidedress soil nitrate-N level is above 20 mg/kg (= 20 ppm), no fertilizer N is necessary [N15]. If the nitrate-N concentration in the soil is below 20 ppm, only enough N to increase soil available nitrate-N to 20 ppm is needed. Approximately 4 lbs N/acre need to be added to increase the soil nitrate level by 1 ppm [N20]. As an example, when the soil nitrate-N concentration is 15 ppm, 20 lbs N/acre are needed to increase the level to 20 ppm. Contact your local farm advisor for more information. Residual soil nitrate and nitrate in the irrigation water can supply significant amounts of N to crops. These N sources are taken into account by CropManage, a web-based irrigation and N management decision support tool developed by UC Cooperative Extension. The program integrates CIMIS reference ET data and field specific soil, plant and management information to calculate crop water needs and estimates fertilizer N needs on a field-by-field basis. CropManage is free to use and can be accessed here and an overview of the program can be found here. Everaarts and de Willigen [N10] reported that placement of fertilizer in a band 2 inches to the side of the row and 2 inches below the soil surface significantly increased the yield at five out of eight sites compared to a broadcast application, while there was no difference at the other sites. In drip-irrigated fields, N can be applied through the drip system [N25]. A surface band application of an ammonium nitrate solution between rosette stage and harvest serves as contact herbicide against broadleaf weeds and as a N source [N25, N40]. The waxy cuticle that broccoli and other cole crops develop once they have at least three true leaves prevents damage to the crop, unless the plants are very wet [N40]. However, because weeds lack this cuticle, they will be burned by the fertilizer with the effect being most pronounced on warm days. 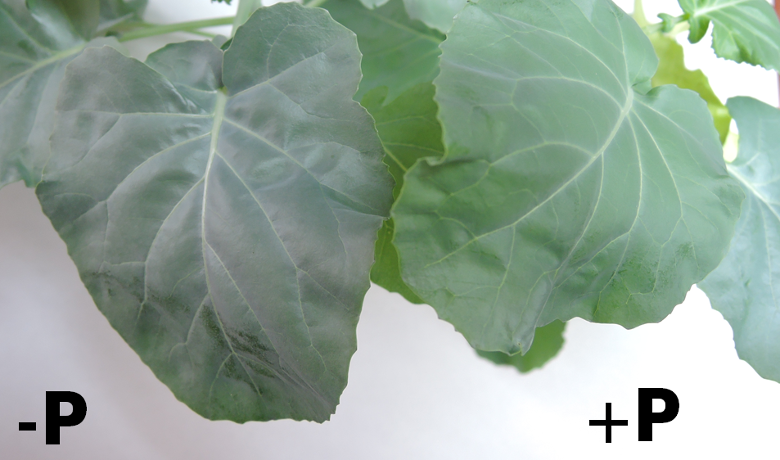 A shielded spray should be used to avoid spraying the growing point or emerging new leaves of the broccoli plant [N40]. Agamalian [N1] found that topical applications of 50 to 60 gallons per acre of undiluted 20% ammonium nitrate were effective in killing weeds. Ammonium thiosulfate was also effective in killing weeds, while the results with urea/sulfuric acid solutions were variable [N1]. The amount of N in these applications is equivalent to 105-125 lbs/acre. Therefore, such high topical applications should only be used when the amount of N applied is needed by the plants at the time of application. The N applied must be integrated into the N fertilization program. Little information on the effect of foliar N application is available. In a trial with furrow irrigated broccoli, Yildirim and coworkers [N43] found that the application of a 0.8% urea solution in addition to a 245 lbs N/acre pre-plant application increased broccoli yield by about 10%. No information about leaching losses of the pre-plant N was given. Foliar N was applied four times in 10-day intervals, starting two weeks after transplanting. Under greenhouse conditions, the growth of broccoli has been found to be reduced when the plants receive N solely in the form of ammonium [N26, N33]. However, under field conditions, ammonium is generally quickly converted to nitrate by soil microorganisms, so that the difference between the ammonium and nitrate can be expected to be minimal [N27, N39]. This is in line with Shelp and Liu [N34] who did not find any differences in yield and N uptake between plants fertilized with calcium nitrate, ammonium nitrate, or ammonium sulfate. Elwan and Abd El-Hamed [N8] found reduced yield with urea compared to ammonium sulfate and ammonium nitrate. While N uptake is minimal during early growth, the N uptake rate is high during the last 4-6 weeks before harvest, reaching 4.5-8.5 lbs/acre per day [N4, N6, N30, N34]. Well fertilized plants took up more than 90% of the N during this period [N4]. Nitrogen uptake rates generally remain high until harvest [N4, N37]. Based on the N uptake pattern, the first sidedress N application is generally made at thinning and the second, if needed, at layby [N24]. N is only applied when the pre-sidedress soil nitrate-N concentration is below 20 ppm (see above). The N contained in broccoli residues left in the field can vary considerably. Values ranging from 80 to 265 lbs N/acre have been reported [N6, N11, N30, N41, N44]. In the same studies, the amount of N in the heads ranged from 35 to 140 lbs/acre. With an N content of 3.5 to 3.8% [N6, N41], which roughly corresponds to a C to N ratio of 11, the residues are easily decomposed and net N mineralization is generally higher after broccoli or cauliflower than after lettuce [N17]. A large proportion of the mineralized N will be available to the next crop, provided it is not leached below the root zone. Phosphorus deficiency symptoms resemble those of N deficiency and include stunted plants and discolored leaves. Older leaves turn reddish purple, which may give them a dull appearance. Leaves of P deficient plants may be abnormally stiff and erect. Older leaves show symptoms first [P12, P15]. The leaves of the P deficient plant have turend reddish purple (photo taken by Patricia Lazicki). Samples are taken from the top foot of the soil profile, which is the major rooting zone [P4]. Even though broccoli roots may be found below a depth of three feet, most roots grow in the top foot of the soil profile [P8, P13]. Soil samples can be taken in fall or spring (see Soil Test Sampling for sampling instructions). Phosphorus availability is generally determined by extracting soil samples with a bicarbonate solution (Olsen-P) [P7]. Bicarbonate extractable P levels above 50 ppm are adequate for broccoli growth and P fertilization is generally not necessary [P7]. Broccoli grown in soils with less than 50 ppm plant available P may benefit from P fertilizer (see Pre-Plant P). Contact your local farm advisor for more information. The P concentration is determined in the most recently matured leaf. A minimum of 20 leaves should be collected, each from a different healthy plant of representative vigor [P4]. Samples are taken from the entire field. Variable fields should be divided into uniform blocks, which are sampled separately [P4]. It is important to accurately determine the crop growth stage since total P concentration declines as crops develop. Once tissue samples are collected they should be dried as quickly as possible [P4]. For more information on sampling procedure see Plant Tissue Sampling. Optimum whole-leaf nutrient concentrations in the most recently matured leaves. Sources: 1) [P1]; 2) [P5]. Due to the fact that P is generally applied pre-plant, tissue P analyses are more valuable as a planning tool for succeeding crops than as a management tool for the current crop. Phosphorus application rates should be based on soil test results [P7]. Bicarbonate extractable P levels above 50 ppm are adequate for broccoli growth. For soils below this level, especially in the winter, pre-plant applications of 40 to 80 lbs/acre of phosphate are recommended [P7]. The amount of P removed with the harvested heads is approximately 30-35 lbs P2O5/acre [P2, P11, P16]. Therefore, an application rate of 40-80 lbs/acre corresponds to the P removed with one to two crops. When soil test P levels are slightly below 50 ppm, only small amounts of P are required which are best applied as starter (see Starter P). For the southern desert and Central Valley, where soil P test levels are generally lower than on the Central Coast, application rates of 150 to 300 lbs/acre P2O5 have been recommended [P7, P14]. Over the long term, these rates are likely to increase soil test values. Regular soil analyses indicate whether the P fertilization program is adequate or should be modified to maintain optimal P availability. For more information, contact your local farm advisor. In general, band applications are more effective than broadcast applications. Bands should be located 2-3 inches to the side of the seeds or plants and 3-4 inches deep [P9]. Broadcast P fertilizer needs to be disked into the soil because P is immobile in the soil and because the surface soil periodically dries out, resulting in a low root density near the soil surface [P10]. Pre-plant P fertilizers are best applied close to the time of planting since P may interact with soil minerals becoming less available over time [P10]. The further away soil pH is from neutral, the stronger P interacts with soil minerals. Phosphorus application rates should be based on soil test results. When the soil P test level is close to 50 ppm, broccoli plants may benefit from a small starter P application. As P is immobile in the soil, fertilizer P applied close to the seeds or transplants may improve early root growth. This is especially true when soil temperatures are low because the bioavailable P is decreased in cool soil [P3, P6]. A starter application of 20 lbs P2O5/acre (9 lbs P/acre) is generally considered appropriate. Phosphorus fertilizer should be banded at the time of seeding or transplanting cole crops. Bands should be located 2-3 inches to the side of the seeds or plants and 3-4 inches deep [P9]. Leaves of K deficient plants are dark green and have scorched edges. Spots of dry tissue (necrosis) on the leaf blade between the veins may also be present. Older leaves are first affected. The leaves may arch backwards lengthwise and the scorched edges generally curl upwards [K10, K13]. The K deficient leaf is smaller and has spots of dry tissue (photo taken by Patricia Lazicki). Samples are taken from the top foot of the soil profile, which is the major rooting zone [K3]. Even though broccoli roots may be found below a depth of three feet, most roots grow in the top foot of the soil profile [K7, K12]. To determine the plant available K, soil samples are most often extracted with an ammonium acetate solution [K6]. Broccoli grown in soils with greater than 150 ppm of ammonium acetate exchangeable K is unlikely to respond to K fertilzation [K6]. When plant available K is lower, fertilization may be beneficial (see Pre-Plant K or K Fertigation). The nutrient concentration is determined in the most recently matured leaf. A minimum of 20 leaves should be collected, each from a different healthy plant of representative vigor [K3]. Samples are taken from the entire field. Variable fields should be divided into uniform blocks, which are sampled separately [K3]. It is important to accurately determine the crop growth stage since total K concentrations change as crops develops. Once tissue samples are collected they should be dried as quickly as possible [K3]. For more information on sampling procedure see Plant Tissue Sampling. Sources: 1) [K1]; 2) [K4]. The K application rate should be based on soil test results. Broccoli grown in soils with greater than 150 ppm of ammonium acetate exchangeable K is unlikely to respond to K fertilization. When the soil K test level is lower, application rates of 100 to 140 lbs K2O/acre are appropriate in order to replace K removed with the harvested crop [K6], which has been found to amount to approximately 80-120 lbs K2O/acre [K2, K9, K14]. In fields with low soil test values, the application rate may be increased, especially when leaf analyses indicate that K supply is insufficient. A higher application rate may also be necessary in very sandy soils where K leaching may increase the amount of K exported from the field. In fields with sprinkler or furrow irrigation, K fertilizers are most commonly applied pre-plant. Pre-plant applications can be broadcast and incorporated into the soil or banded. 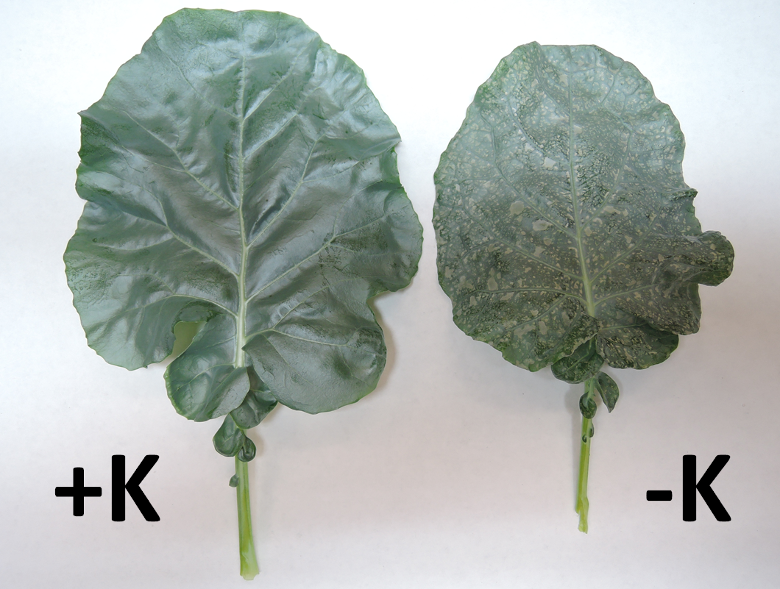 Due to salt effects, the total of N plus K2O in the band should not exceed 90 lbs/acre [K8]. If more K is needed, the remainder should be broadcast and incorporated into the seedbed prior to planting [K8]. In drip irrigated fields, K can also be applied by fertigation during the growing season. As is the case with N, broccoli takes up most of the K during the second half of its growth cycle [K9, K11], which is the time when the K supply needs to be adequate. Potassium chloride (KCl), also known as muriate of potash, and potassium sulfate (sulfate of potash; K2SO4) are the most commonly used fertilizers. Fact sheets of the most common fertilizers can be found on the web site of the International Plant Nutrition Institute. For fertigation, KCl is generally preferred over K2SO4 due to its higher solubility [K5]. Agamalian, H.S., 1988. Weed control in crucifer crops with nitrogen fertilizers. California Agriculture 42(6), 16-17. Bakker, C.J., Swanton, C.J. and McKeown, A.W., 2009. Broccoli growth in response to increasing rates of pre-plant nitrogen. I Yield and quality. Canadian Journal of Plant Science 89, 527-537. Bélec, C., Villeneuve, S., Coulombe, J., Tremblay, N., 2001. Impact of nitrogen fertilization on yield, hollow stem incidence and sap nitrate concentration in broccoli. Canadian Journal of Plant Science 81, 765–772. Bowen, P.A., Zebarth, B.J., Toivonen, P.M.A., 1999. Dynamics of nitrogen and dry-matter partitioning and accumulation in broccoli (Brassica oleracea var. italica) in relation to extractable soil inorganic nitrogen. Canadian Journal of Plant Science 79, 277–286. Castellanos, J.Z., Villalobos, S., Delgado, J.A., Muñoz-Ramos, J., Sosa, A., Vargas, P., Lazcano, I., Alvarez-Sanchez, E., Enriquez, S.A., 2001. Use of best management practices to increase nitrogen use efficiency and protect environmental quality in a broccoli-corn rotation of central Mexico, Communications in Soil Science and Plant Analysis 32, 1265-1292. Doerge, T.A., Roth, R.L., Gardner, B.R., 1991. Nitrogen fertilizer management in Arizona. College of Agriculture, the University of Arizona. Elwan, M.W.M., Abd El-Hamed K.E., 2011. Influence of nitrogen form, growing season and sulfur fertilization on yield and the content of nitrate and vitamin C of broccoli. Scientia Horticulturae 127, 181–187. Everaarts, A.P., 1994. Nitrogen fertilization and head rot in broccoli. Netherlands Journal of Agricultural Science 42, 195-201. Everaarts, A.P., de Willigen P., 1999a. The effect of nitrogen and the method of application on yield and quality of broccoli. Netherlands Journal of Agricultural Science 47, 123-133. Everaarts, A.P., de Willigen P., 1999b. The effect of the rate and method of nitrogen application on nitrogen uptake and utilization by broccoli (Brassica oleracea var. italic). Netherlands Journal of Agricultural Science 47, 201-214. Feller, C., Fink, M., 2005. Growth and yield of broccoli as affected by the nitrogen content of transplants and the timing of nitrogen fertilization. HortScience 40, 1320-1323. Gardner, B.R., Roth, R.L., 1989. Midrib nitrate concentration as a means for determining nitrogen needs of broccoli. Journal of Plant Nutrition 12, 111-125. Hartz, T., 1996. Nitrogen management through intensive on-farm monitoring. FREP Final Report. Hemphill, D., Hart, J., 1992. Effect of rate, timing of application, and placement of nitrogen fertilizer on broccoli yield and nitrogen uptake. Hochmuth, G., Maynard, D., Vavrina, C., Hanlon, E., Simonne, E., 2012. Plant tissue analysis and interpretation for vegetable crops in Florida. Kubota, A., Thompson, T.L., Doerge, T.A., Godin R.E., 1997. A petiole sap nitrate test for broccoli, Journal of Plant Nutrition 20, 669-682. Le Strange, M., Mitchell, J.P., Jackson, L.E., 1998. Determination of best nitrogen management practices for broccoli production in the San Joaquin Valley. FREP Final Report. Le Strange, M., Cahn, M.D., Koike, S.T., Smith, R.F., Daugovish, O., Fennimore, S.A., Natwick, E.T., Dara, S.K., Takele, E., Cantwell, M.I., 2010. Broccoli production in California. UC ANR Publication 7211. Liu, L., Shelp, B.J., 1993a. Nitrogen partitioning ni greenhouse-grown broccoli in response to varying NH4+:NO3- ratios. Communications in Soil Science and Plant Analysis 24, 45-60. Liu, L., Shelp, B.J., 1993b. Broccoli yield and nitrogen composition in response to different management regimes. Communications in Soil Science and Plant Analysis 24, 61-84. Montagu, K.D., Conroy, J.P., Francis, G.S., 1998. Root and shoot response of field-grown lettuce and broccoli to a compact subsoil. Australian Journal of Agricultural Research 49, 89-97. Oregon State University, 2004. Commercial vegetable production guides. Broccoli. Rincon L., Saez J., Perez Crespo J.A., Gomez Lopez M.D., Pellicer C., 1999. Crecimiento y absorcion de nutrientes del brocoli. Investigación Agraria. Producción y Protección Vegetales 14, 225-236. Sanchez, C.A., 1998. Diagnostic tools for efficient N management of vegetables produced in the low desert. FREP Final Report. Scaife, A., Turner, M., 1983. Diagnosis of mineral disorders in plants. Vol. 2. Vegetables. Her Majesty’s Stationery Office, London. Shelp, B.J., 1987. Plant characteristics and nutrient composition and mobility of broccoli (Brassica oleracea var. italic) supplied with NH4+, NO3- or NH4NO3. Journal of Experimental Botany 38, 1603-1618. Shelp, B. J., Liu, L., 1992. Nutrient uptake by field-grown broccoli and net nutrient mobilization during inflorescence development. Plant and Soil 140, 151-155. Smith, R., 2010. Fine tuning nitrogen management for vegetable production. UCCE Monterey County Crop Notes March/April 2010, 12-14. Smith, R., Cahn, M., Hartz, T.K., 2012. Survey of nitrogen uptake and applied irrigation water in broccoli, cauliflower and cabbage production in the Salinas Valley. FREP Annual Report. Thompson, T.L. Doerge, T.A., Godin, R.E., 2002. Subsurface drip irrigation and fertigation of broccoli: I. Yield, quality, and nitrogen uptake. Soil Science Society of America Journal 66, 186–192. Thorup-Kristensen, K., 1993. Root development of nitrogen catch crops and of a succeeding crop of broccoli. Acta Agriculturae Scandinavica Section B 43, 58-63. Tremblay, N. 1989. Effect of nitrogen sources and rates on yield and hollow stem development in broccoli. Canadian Journal of Plant Science 69, 1049-1053. UC IPM, 2012. UC IPM Online: Year-round IPM program for cole crops. UC ANR Publications. Vågen, I.M., Aamlid, T.S., Skjelvåg, A.O., 2007. Nitrogen fertilization to broccoli cultivars at different planting times: Yield and nitrogen use. Acta Agriculturae Scandinavica, Section B 57, 35-44. Wallace, T., 1953. The diagnosis of mineral deficiencies in plants by visual symptoms. Chemical Publishing Co. New York, N.Y.
Yildirim, E., Guvenc, I., Turan, M., Karatas, A., 2007. Effect of foliar urea application on quality, growth, mineral uptake and yield of broccoli (Brassica oleracea L., var. italic). Plant, Soil and Environment 53, 120–128. Zebarth, B.J., Bowen, P.A., Toivonen, P.M.A., 1995. Influence of nitrogen fertilization on broccoli yield, nitrogen accumulation and apparent fertilizer-nitrogen recovery. Canadian Journal of Plant Science 75, 717-725. Costigan, P.A., 1986. The effects of soil temperature on the response of lettuce seedlings to starter fertilizer. Plant and Soil 93,183-193. Johnstone, P.R., Hartz, T.K., Cahn, M.D., Johnstone, M.R., 2005. Lettuce response to phosphorus fertilization in high phosphorus soils. HortScience 40, 1499-1503. Yoldas, F., Ceylan, S., Yagmur, B. Mordogan, N., 2008. Effects of nitrogen fertilizer on yield quality and nutrient content in broccoli. Journal of Plant Nutrition 31, 1333-1343.
International Plant Nutrition Institute. Nutrient source specifics.